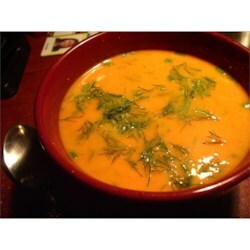 "A beautiful and tasty soup made with pureed carrots and fresh dill. If fresh herbs are not available, use 1/3 of the amount for dried herbs." Bring a large saucepan of water to a boil. Add carrots, and cook just until tender. Drain, and return the carrots to the pan. Set aside. Heat oil in a skillet over medium heat. Saute onion and garlic until soft, about 5 minutes. Transfer the onion and garlic to the saucepan with the carrots, and pour in chicken stock. Turn heat to medium-low, cover and simmer for 25 minutes to blend flavors. Puree the carrot mixture in a food processor or blender, in small batches if necessary. Return to the saucepan, and stir in the milk, dill and chives. Cook just until heated through, and serve. 1 pound of carrots equals about 3 cups chopped. Perhaps it was my method, but I think I followed the recipe exactly... this tasted like baby food mixed with dill and milk. I couldn't serve it.